Firing up the grill is a perfect way to entertain in the summer – definitely a go-to choice for us when we’re hosting friends and family! One of the very best things about hosting a BBQ is that you’re doing the cooking right outside where the action is, hanging out with your guests in the gorgeous summer weather, even while you’re finishing up the cooking. But a casual BBQ party isn’t much fun if it’s disorganized – especially not for the stressed-out host! And I don’t know about you, but if I’m inviting a bunch of people over for a chill summer party, I sure want to be having fun, too! Making your BBQ Party FUN! So how do you avoid a disorganized stress-fest? Just make a simple game plan! A little planning goes a long way! Consider the flow of the meal, the timing of each recipe, and the ways that you can save some stress by completing parts of the meal ahead of time (whether that means doing a bit of the prepping and chopping ahead, or completing entire make-ahead recipes before the party swings into gear). 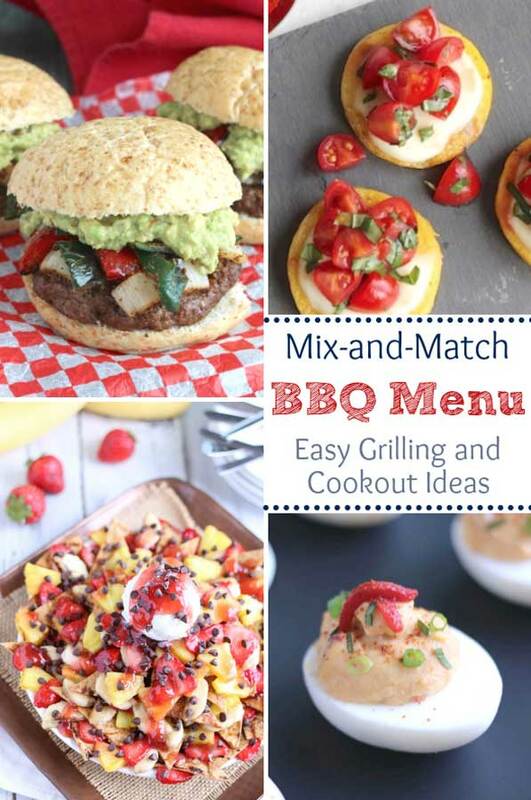 To help you plan the perfect, über-organized summer BBQ party, I’ve compiled a mix-and-match list of our favorite grilling recipes. Everything from appetizers to dessert can be made right out there on the grill! You can offer up some grilled appetizers and mingle for a while, then fire up the main dish and maybe even a grilled side. And to end the evening, you can pull off an impressive grilled dessert before guests happily head for home, murmuring their appreciation for an amazing evening. If you don’t want every part of the meal to focus on the grill, though – or if you want to add in a few extra appetizer munchies or side dishes – I’ve also included some non-grilled options you can slot into your game plan to fill out your menu. These non-grilled, make-ahead recipes will let you entirely complete at least some of the dishes before the party – another way to ensure that you’re able to kick back and actually enjoy your own bash! And speaking of make-aheads: you know I’m allllll about making life easier by prepping ahead when I can. So, even if you do choose to grill every course of your cookout menu during the party, be sure to read through our recipes in advance. Specifically look for the places where you can complete prep work or even entire recipe steps ahead of time, so the final meal comes together easily (and you look like a BBQing superhero)! Go grab a paper and pencil … and let’s make a plan! Grilling the main course is obvious. But grilling up the appetizers? Well, that’s a little more unique! Try these sure-to-impress ideas to get your party rollin’! 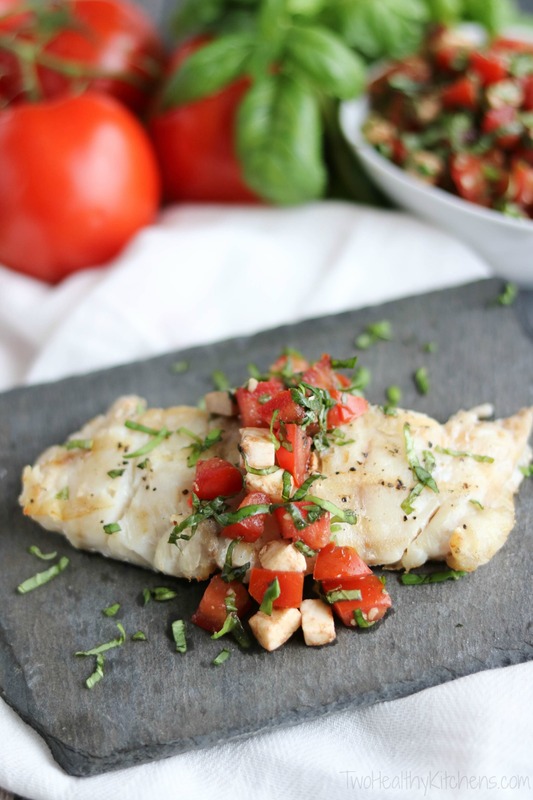 So pretty with those summery tomatoes and fresh basil … and surprisingly easy! This recipe also works nicely as a side dish offering, if you choose to skip the appetizer course altogether. This is a simple but surprisingly delicious appetizer – and filling enough to keep everybody’s hunger at bay while you work on grilling the main event. It’s also nice as a vegetarian main course option (but be warned … even non-vegetarians will be fighting for the last slice!). 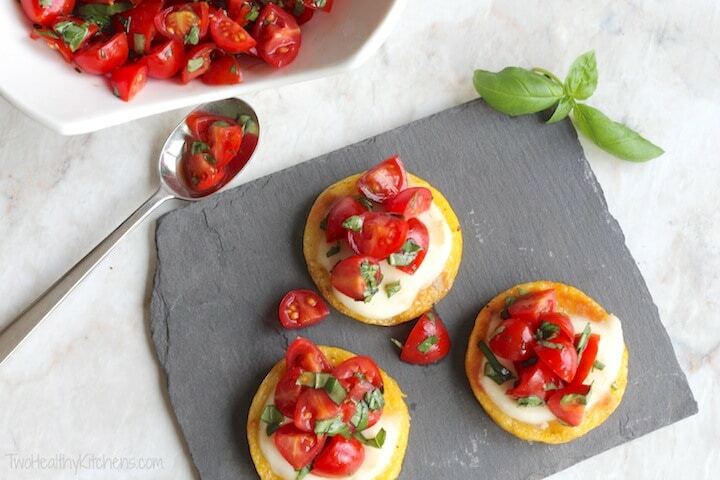 Here’s another idea using grilled polenta rounds, because that’s such a simple way to create impressive individual appetizers! 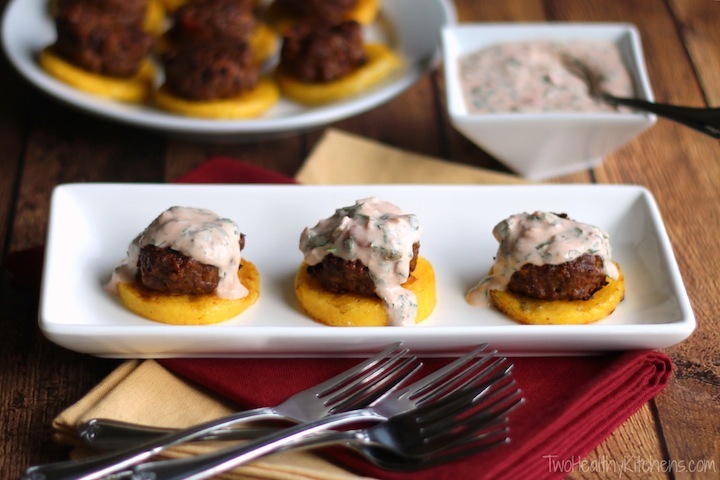 These mini burgers are a hearty way to kick off a BBQ – they’d actually be a great starter course if you plan to munch a little, and then take a break for guests to swim or play yard games, with the rest of the meal following a little later on. These sliders are truly even substantial enough to serve as a main course, surrounded by some great side dishes or picnic salads. With this recipe, you’ve definitely got a lot of options! Even if you want to try one of our grilled appetizer recipes above, it’s often a good idea to have a make-ahead appetizer all ready to go when your guests start to arrive. These are perfect additions to practically any BBQ menu, no matter what else you’re throwing on the grill! I’m not kidding about the 5-minute prep time here. 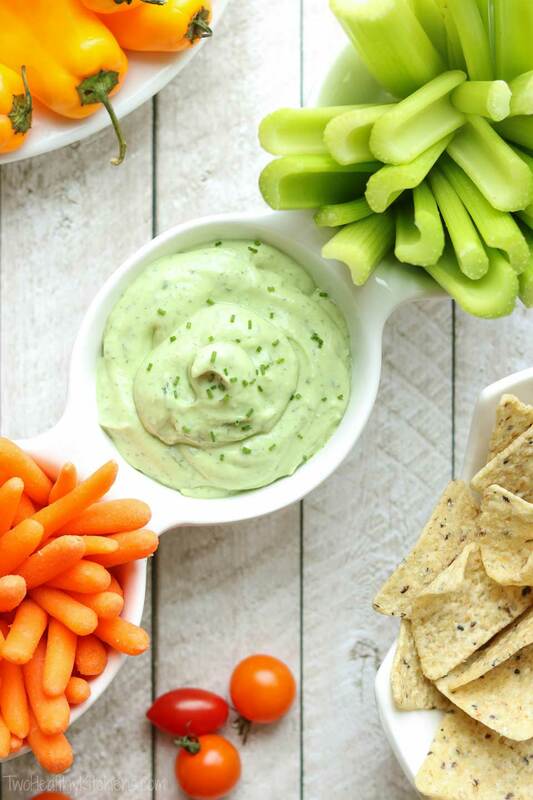 This dip is seriously easy to throw together! It’s terrific with veggies, or with whole-grain tortilla chips … or BOTH. 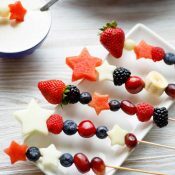 Bonus points: for an extra-fun and colorful appetizer platter, try serving this with our pretty Rainbow Veggie Kabobs! 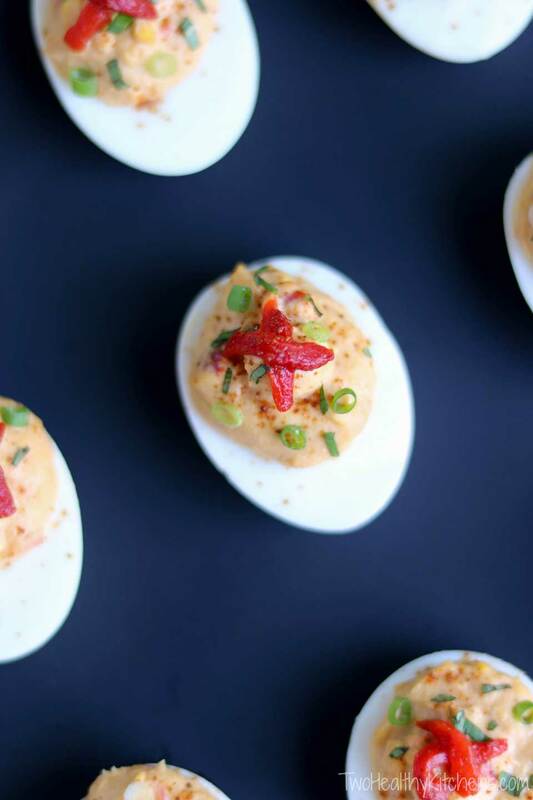 Deviled eggs are an absolute staple at summer picnics and cookouts! This version is a fresh twist on the classic, and a bit more dressed-up and gourmet. If you’d like to offer two options on your deviled egg plate, you could also try our “plain” Hummus Deviled Eggs, too! I absolutely love including fruit on summer party menus. It’s light and healthy, and such a refreshing choice on hot days. 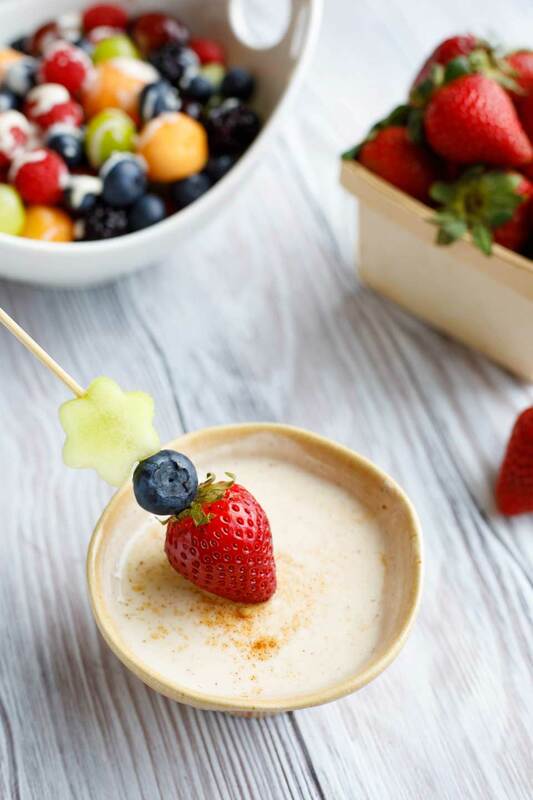 This fruit dip is delicious alongside an appetizer tray piled high with fresh summer fruit, or you can amp up the fun by serving it alongside fruit kabobs or even a fruit bouquet centerpiece! There’s absolutely nothing wrong with grilling up some regular ol’ lean hamburgers or turkey burgers. 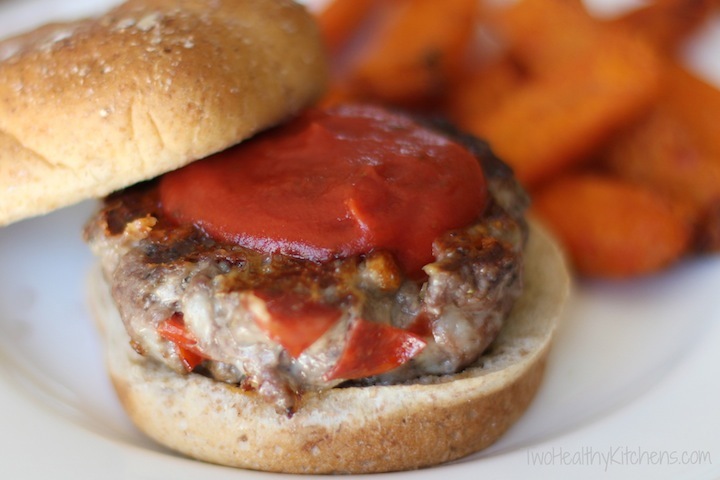 Burgers are always a cookout favorite! 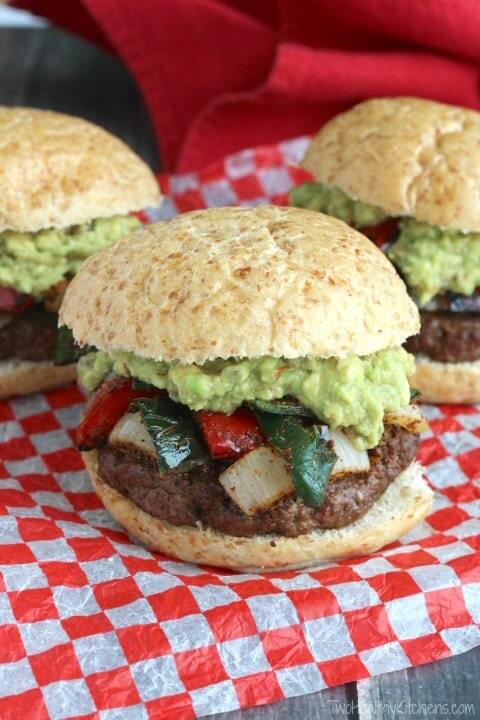 But why not change things up a bit and add some extra flair to your barbecue menu with these fantastic Fajita Burgers? Definitely more memorable! 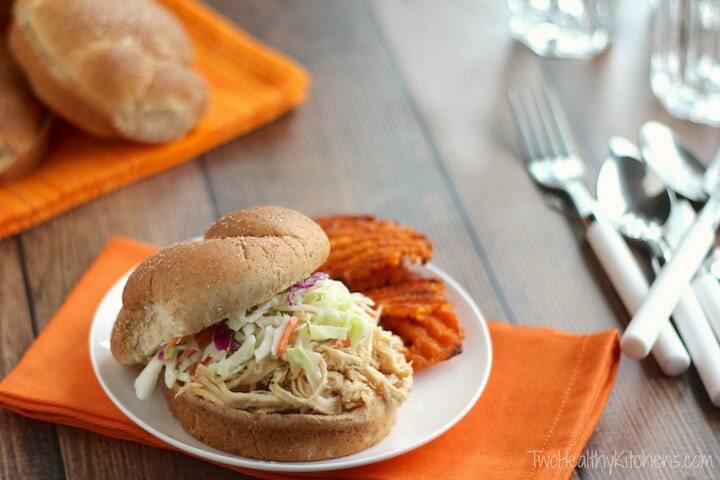 This chicken absolutely sings with bright, fresh flavors! It’s quick and easy for entertaining, since you get the chicken marinating before your party begins. Plus, you’ve probably got most of the ingredients you need, already waiting in your pantry! These are pretty much a slam dunk. I mean, for real here … we’re talking pizza + hamburgers, combined in one gloriously juicy, satisfying sandwich! Such quintessential summer flavors! This recipe was shared with us by the chef at a beloved Hilton Head restaurant, and it instantly became a family favorite. 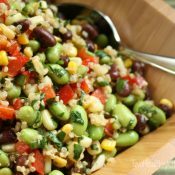 It’s a great alternative to the typical burgers-and-dogs routine you so often find at cookouts and barbecues! These are sort of a bigger version of the cute little Polenta Sliders I mentioned above. They’re absolutely bursting with flavor from healthy veggies, but still satisfyingly beefy. Best part? 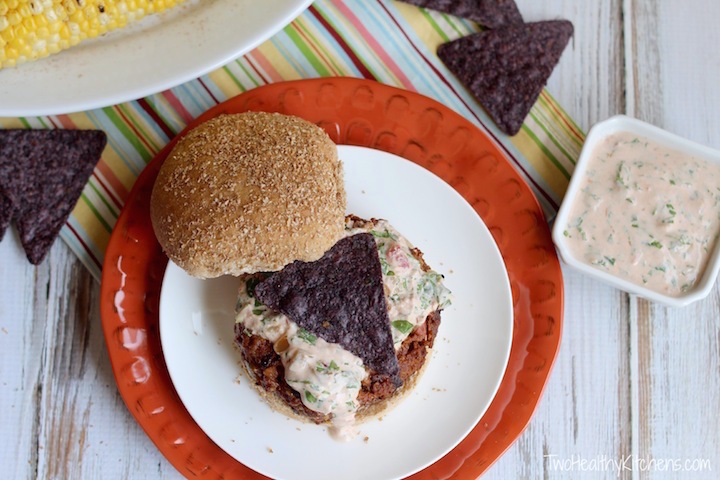 They’re topped with a delicious Greek yogurt salsa sauce and crunchy tortilla chips! 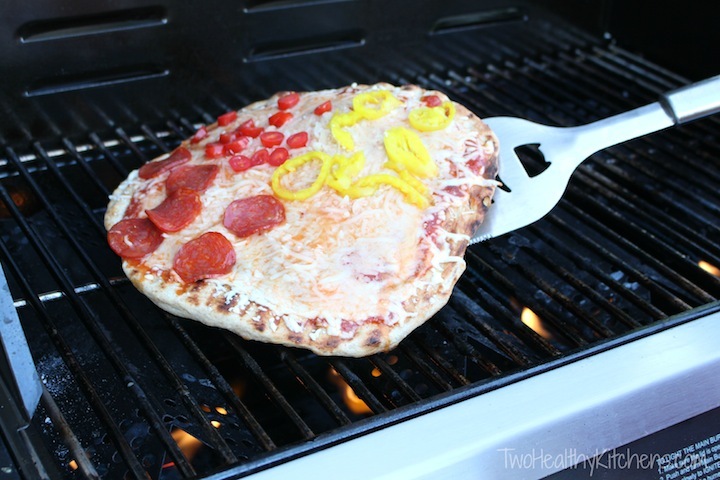 To really get people mingling and chatting, use this idea as an interactive, make-your own pizza party! It’s an instant conversation booster, which can be terrific if you’re hosting friends and family who don’t yet know each other very well. Set out lots of different toppings, and your guests will have a blast debating what to choose as they customize their own sections of made-to-order pizzas. (You can also choose to make smaller, personal pizzas instead). A bonus for you, oh Grill Master: your guests all rotate through, hanging out with you by the grill as you crank out their creations. It’s impressive and a lot of fun, too! 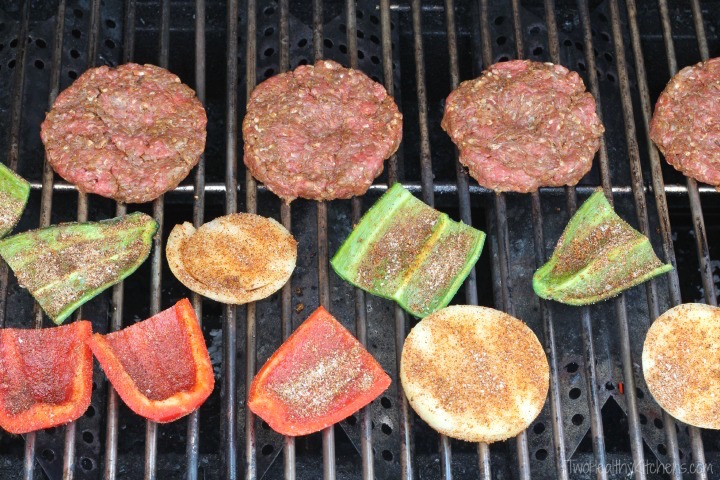 Veggies and the grill were made for each other! Grilling caramelizes their natural sugars and heightens their flavors. So simple, with practically no extra work at all, since you’re already firing the grill up, anyway. It’s basically the same magic that happens when you roast vegetables in the oven (remember how I blather on and on about how much I adore that technique?) 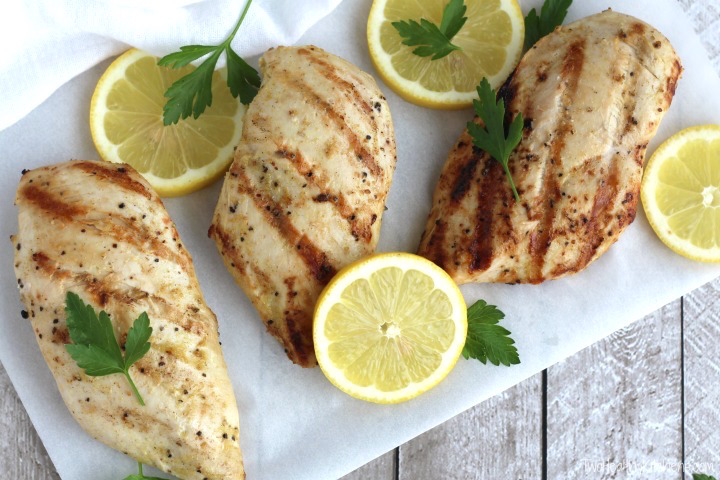 … but with grilling, the magic happens outside in the gorgeous summer sunshine (even better!). 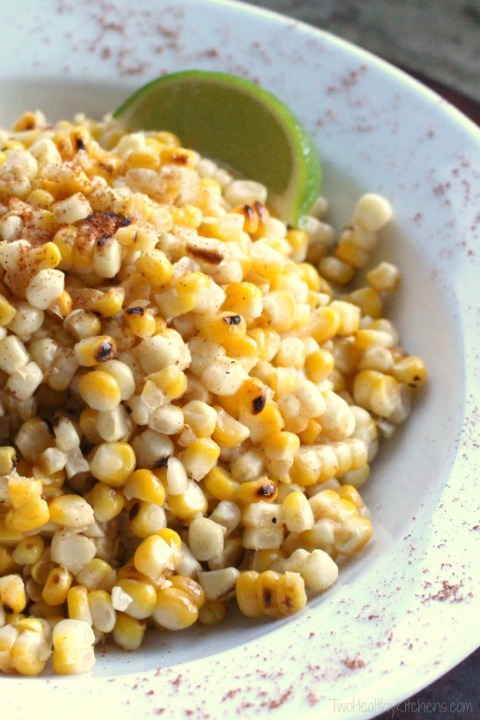 Throw some corn on the grill alongside your main dish for an easy side with big, big flavors! The smoky-sweet grilled corn is beautifully balanced out by a little tangy lime juice and a pleasant, tingling heat from cayenne pepper. If you don’t want to spend time cutting the corn from the cob to toss this salad together during the party, you can actually make this salad up to a day ahead, too. It’s still technically a grilled side dish, if you wanna go the all-grilled route for your menu, but you’ve saved your sanity a bit by getting some of the work done before the party – brilliant! How to Make Other Easy Grilled Side Dishes – No Recipe Needed! 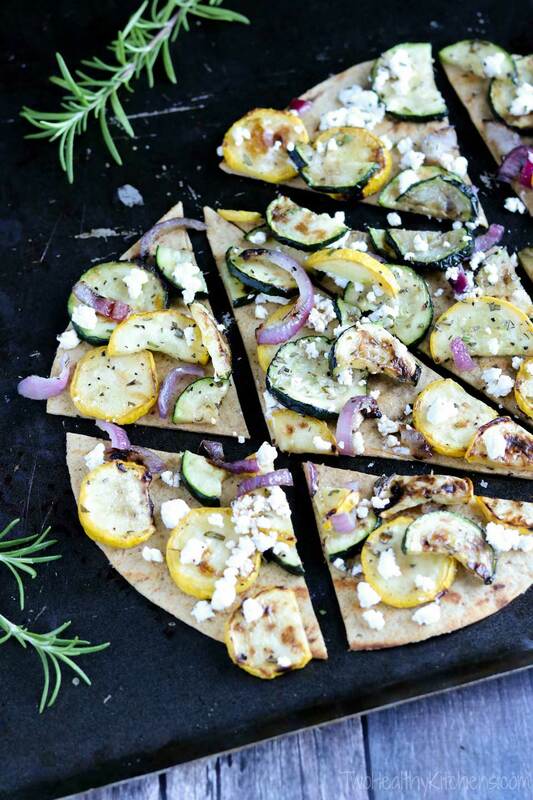 You really don’t even need a specific recipe to create fantastic grilled veggie side dishes. To be honest, we often just wing it – and it works out beautifully. Take a look at the main dish you’ve chosen and decide what veggies will be nice alongside (or take a peek at what produce looks best at the market). Whatever you choose, toss your vegetables with a bit of olive oil, and give ’em a hit of salt and pepper. If you want, you can also sprinkle on a few other spices that highlight the flavors in your main dish, but you really don’t even have to go that far – simple salt and pepper is enough. Grill the veggies in a grill basket to keep them from falling through the grates, or arrange them on skewers as pretty kabobs (check out our post on The Secret to Perfect Shish Kabobs for more detailed suggestions on getting the best results). A few to try: maybe cut big chunks of onions and colorful peppers. Or, line up tender asparagus or crisp green beans in your grill basket and give them a few minutes to get slightly blistered and toasty (without getting mushy). These are ideas we use a lot, and they’re just scrumptious! After grilling, nibble a couple of the veggies to see if you need to adjust the seasoning … and serve them up, piping hot, for a vibrantly delicious, super-nutritious side dish! 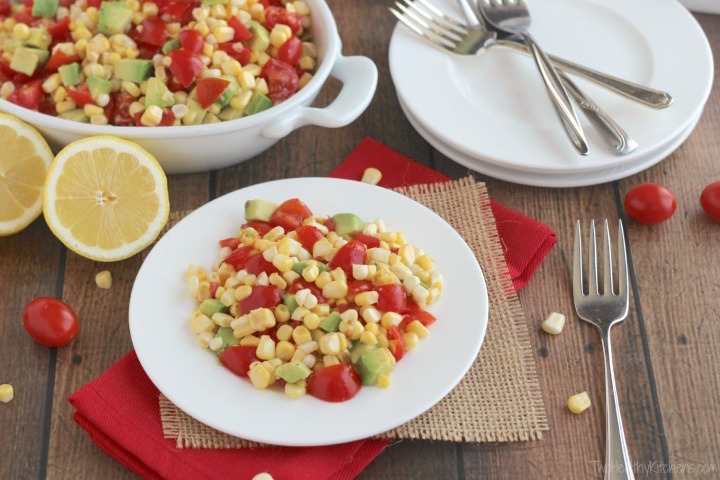 This simple combination just screams “SUMMER!” with its candy-sweet, fresh summer corn and bright, perfectly ripe tomatoes. Mmmmm … plus the buttery, melt-in-your-mouth avocados. Awesome. 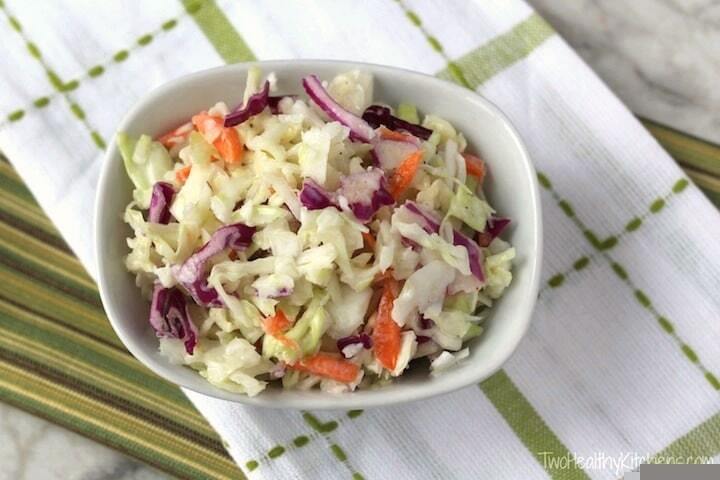 A great alternative to the Grilled Corn Salad above. 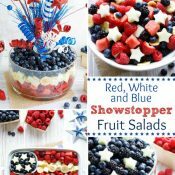 Layered picnic salads are a classic offering at cookouts and summer potlucks. 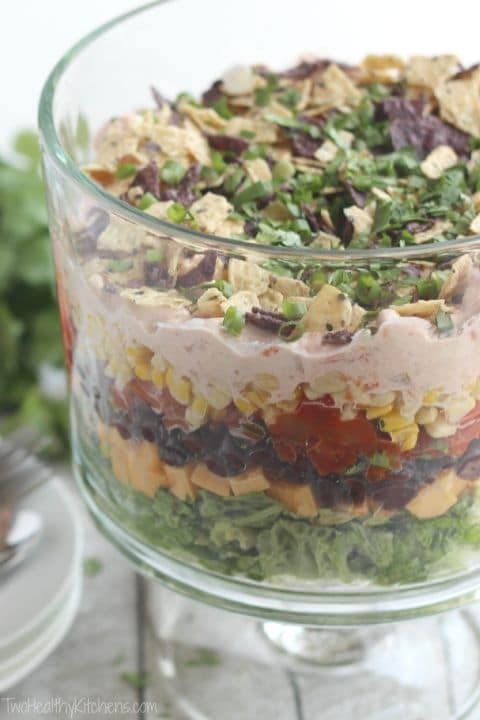 Our yummy riff is a fun mash-up of those classic salads, combined with a Mexican 7-layer dip. Two faves in one! And hey, hey … for those of you who prefer mayo-free salad recipes … there’s not one bit of gloppy mayo in sight! Maybe even more unique than making your appetizers on the grill … making a grilled dessert! Both of these creations draw upon a summery, tropical theme and are loaded up with healthy but lusciously sweet, caramelized fruits. They’re crazy-delicious, but your guests won’t have all the guilt of filling up on a fatty, heavy dessert they’ll regret later. And trust me – you’ll definitely earn bonus points for the fun twist of presenting a grilled dessert to end your perfect BBQ menu! 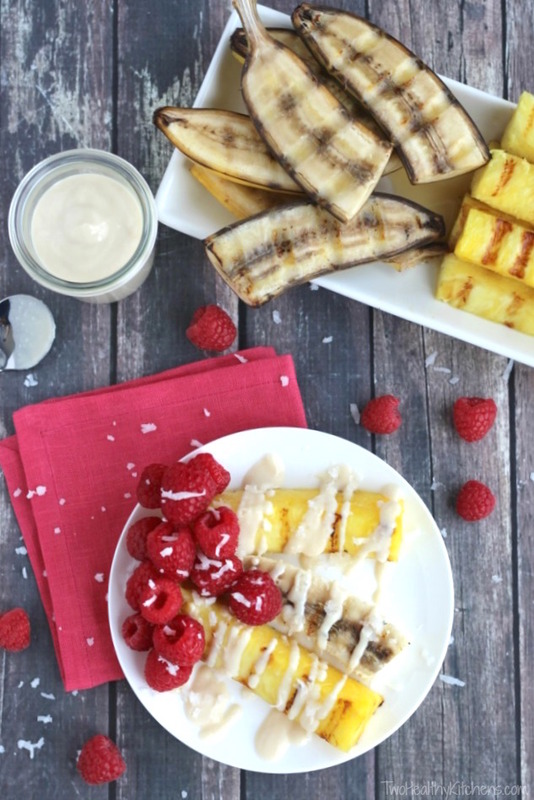 I love to serve the warm, grilled pineapple and bananas alongside some cool, sweet berries – but that’s totally optional. Either way, the lick-your-plate, 4-ingredient sauce adds ideal extra sweetness and a pop of almond-vanilla flavor that ties everything together. If you think that fruit is too healthy to be a decadent dessert … think again! 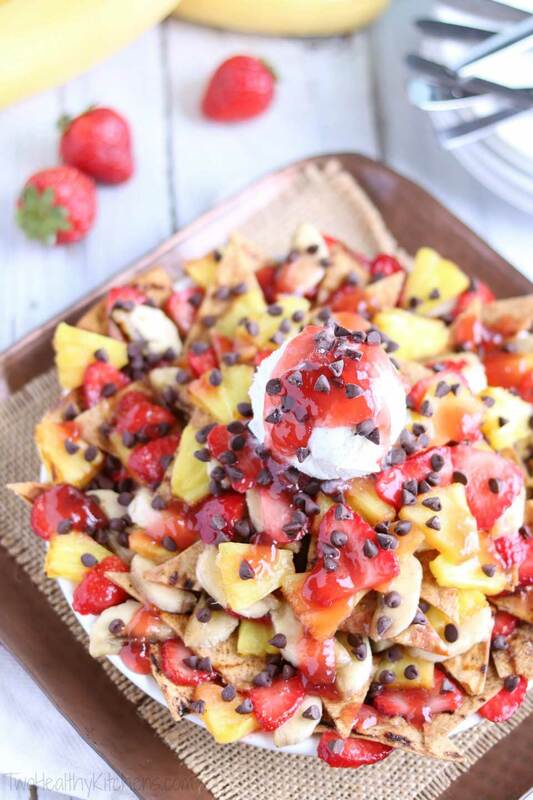 Dessert nachos? Kinda unexpected, right? But dessert nachos off the grill?!? That’s something your guests will definitely remember! These have all the beloved flavors of a banana split … repackaged in a totally unique way! Crispy, sweetened “nacho chips,” caramelized fruit, and a delicious strawberry sauce. Psssst … they’re even better with a little scoop of ice cream! 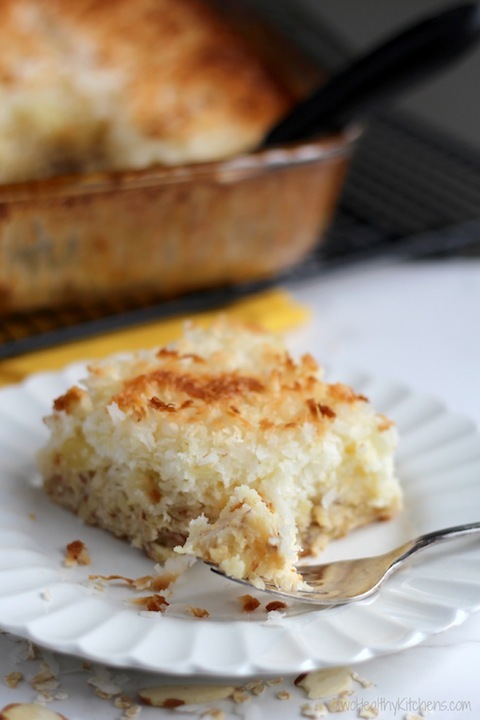 Quick, easy, decadent, and surprisingly nutritious, too! And such an impressive way to end your cookout! But what if you’re thinking that, by the time dessert rolls around, you’ll be ready to take a break from hovering over the grill? Maybe you’d rather just make a summery dessert ahead of time? No shame in that! Try one of these easy, make-ahead desserts. They’re still healthier than so many of the weigh-you-down desserts people often bring to picnics (who wants to feel bloated and overfull after a party – especially a summer party??). But they’ll definitely still end the party on a satisfyingly sweet note your guests will love! You can mix up this cake in just moments – using pantry staples! Hurray! It’s a perfect go-to recipe when you don’t want to fuss over dessert, but still want it to look like you fussed. A boxed angel food mix gets all gussied up with the tropical flavors of juicy pineapple, crunchy almonds and toasted coconut … quick and easy to make ahead, yet so pretty and really delicious! Is it going to be extra hot the day of your cookout? Well then, how about a refreshing frozen dessert? Mmmmmmm … perfect! How about a frozen dessert that’s creamy, dreamy, chocolate-y (and still light and healthy, too)? Even more perfect, right?!? 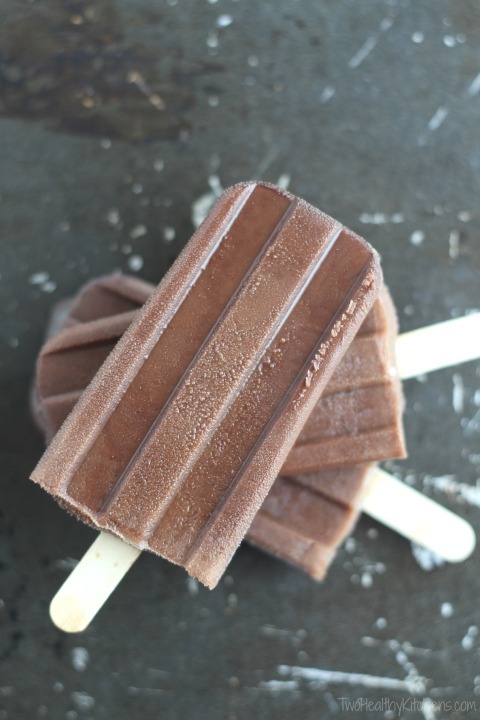 These decadently rich homemade fudgesicles require only 4 simple, pantry-staple ingredients (easy-peasy!). And they’re all-natural and fat-free, too! Guaranteed: both kiddos and adults will LOVE them! You could even make a couple different popsicle recipes for a little variety – try our yummy Strawberry Sundae Yogurt Ice Pops or our Easiest-Ever Grape Popsicles! Don’t want to heat up your kitchen by baking on a hot summer day? I hear ya! 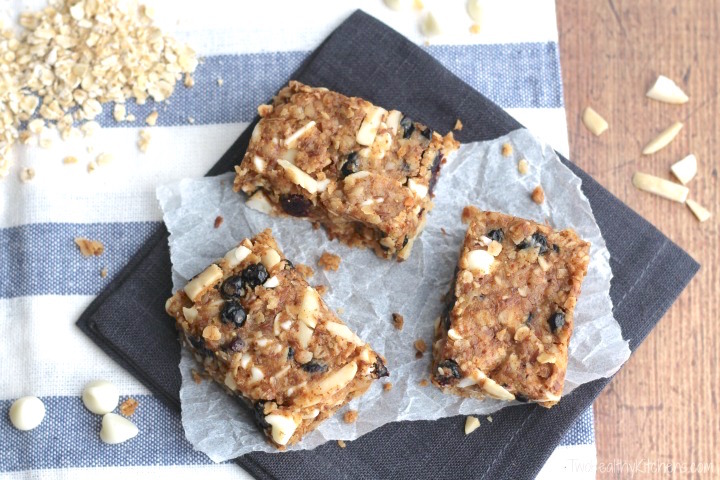 And with these no-bake cookie bars, you don’t have to! The only problem here is that, if you make them too far ahead, they may disappear long before the party even starts. (Seriously – they’re that good!) So you may have to hide them from your kids. And … ahem … maybe even from yourself! Oh – and if you like the bar cookie idea, I can also highly recommend our Kentucky Derby Chocolate-Pecan Cookie Bars. These do require an oven, but they’re so crazy-good that, after just his first couple of bites of the very first test batch, my son declared that he wanted them for his next birthday party. No kidding. Absolutely worth firing up the oven, I promise! Whatever menu you decide on, remember to plan and prep ahead as much as you can, and to look for BBQ recipes that will let you enjoy your own party as much as your guests do. « Amazon Prime Day 2018 … Cooking Deals Handpicked for Our THKers!